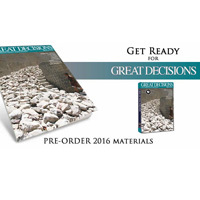 The $25 Great Decisions Briefing Book features impartial, thought-provoking analyses on the eight topics selected for this year’s series. It's time to register for Great Decisions 2016, the ever-popular series of current events presentations and discussions led by Webster University faculty and sponsored by the Webster University Alumni Association. Because inclement weather disrupted the program several times last year, the schedule this year has been moved to eight consecutive Monday evenings in March and April instead of February and March. Each talk is from 7 p.m. to 8:45 p.m. in the University Center Sunnen Lounge, 175 Edgar Rd. on Webster University's home campus in Webster Groves. Join us for this popular lifelong learning opportunity on campus, and take advantage of the opportunity to meet and connect with some of Webster’s current faculty members as well as other Webster alumni. Reservations are requested by Feb. 26, 2016. Space is limited, so please make your reservation today. You can register online, by calling the Webster University Alumni Association at 314.968.7148 or by email to racheljohnes25@webster.edu. The Great Decisions Discussion Program is the Foreign Policy Association’s public education initiative to create more informed and engaged citizens by bringing people together to discuss U.S. foreign policy and global affairs issues. The Webster University Alumni Association is one of many Great Decisions groups throughout the country. Founded in 1918, the Foreign Policy Association is a nonprofit organization dedicated to inspiring the American public to learn more about the world.